Home Clothing The Ultimate Festival Survival Kit! So summer is here, which can only mean one thing, Festival Season has begun! The evenings are meant to be spent outside listening to sweet tunes, indulging in scrumptious food, and sipping on chilled cider. It’s all about letting loose and having a blast, you are there to enjoy yourself! However, there are some aspects that you have to take into serious consideration too, for example what you take with you is what you have to live on for a week, so take my advice and pack smart! I, myself have been to a few festivals, so I understand how difficult it can be to pack light, but also efficiently. So, what I have done is put an assortment of must haves together to create the Ultimate Festival Survival Kit that will see you through until the end. You will need luggage that is extremely light weight. Trust me on this, carrying your belongings to and from the campsite is probably the least fun part of the festival. You will pull up in the festival car park (which is usually in the next field! And a 10 minute walk away from the campsite) and then it hits you, ok so I have to carry my tent, multiple bags of food, and bedding all the way over to my pitch, how on earth am I going to do this? Let’s face it, you just want to put up your tent and organise your belongings in the least amount of time possible. The festival grounds are calling your name and you shouldn’t keep them waiting! You will also need to think about compatibility. Not only do you have to take clothes and toiletries with you, but you will also need to take other essentials such as food, a tent, bedding, gas cooker, pots and pans, plates etc. and it all has to fit in your car! Plus if you and two other friends are all going in one car then you are going to have to make room for all of their belongings too. Don’t worry I didn’t go into our luggage department and pick up any old case. I spent a good portion of the day packing and unpacking different cases with what I would call “festival essentials”, and in time I finally hunted down the perfect festival case; the Antler Urbanite Mega Double Decker. You may be a tad sceptical about this case, and you might be thinking “but isn’t that case way too big to take to a festival? Aren’t I meant to take a small compactible case?” I myself thought the exact same thing, that was until I tested it out and the answer is no, this case is perfect! First of all this case is extremely light weight (even after you’ve packed all of your belongings!) so you can tick point one (above) off of your list. Secondly it’s a soft shell case that has been made from a vigorously strong material that can withstand 135 litres of constant strain from heavy luggage. By using a soft shell case this instantly maximises the space in your car so now there is plenty of room for other bits and bobs, so point 2 has been hit bang on the head. 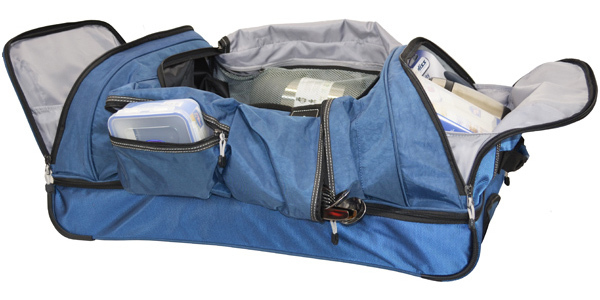 Transportation is made particularly easy thanks to this case’s featured locking system, easy glide wheels, multiple carry handles and straps (perfect for when crossing rough or flat terrain, for example a festival field). Usually when I go camping I take a sleeping bag with me because they’re basic, they take up little room and they keep you warm. Personally I would love to be able to take actual bedding with me, it would be so much more luxurious, but unfortunately bedding takes up way too much room in the car. Plus, I don’t know about you but I don’t want to get my bedding dirty, (I have to sleep in it after the festival too!) and let’s face it the boot of a car isn’t always the cleanest of places. Well, what if I told you that you can take a duvet and you can take a comfy pillow and you don’t have to worry about lack of space? I know that I would be over the moon if someone told me that! Well Feast your eyes, thanks to the Urbanite Mega Double Decker’s practical and versatile compartments there is now room for bedding! I have managed to pack a Spundown 3.0 tog single duvet and a Spundown pillow in the very bottom compartment; of course if you didn’t want to take bedding with you then this section is excellent to store extra items of clothing, muddy wellies, a pair of Dubarry leather boots or towels. I have chosen bedding from the Spundown range as it is perfect for all of your festival slumbering needs. As well as being supremely comfortable and light weight, after a muddy weekend both the duvet and the pillow can be washed at 60º in a domestic washing machine, job done! If you have ever been to a festival before then you know that food can be expensive, especially when you are buying 2 meals a day. So what I usually do is take cans of essentials like beans, spaghetti and pasta packets and buy a meal from one of the stalls in the evenings. 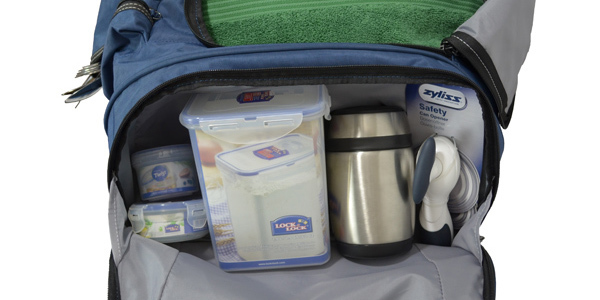 Lock & Lock air tight containers come in very handy when it comes to storing food for when you’re on the go. The range provides robust, sealable containers that come in a wide variety shapes and sizes. Ok so you and your friends have just cooked an evening meal back at the campsite, you look at the time and realise your favourite band is about to appear on stage in about 10 minutes, there’s simply not enough time to scoff down your food and get to the arena in time. You are desperately hungry after all of that dancing you’ve been doing during the first half of your day, what do you do? Well don’t fret, you can still enjoy your spag-bol and get to the main stage in time! 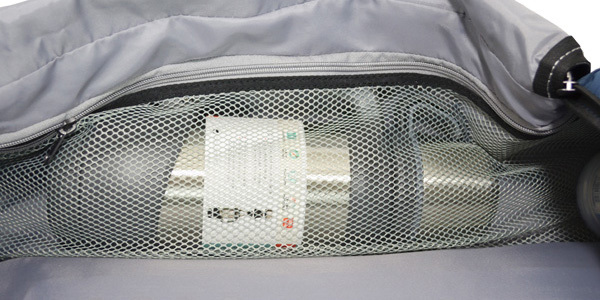 With the Stainless Steel Vacuum food flask (in store only), you can keep your food nice and hot thanks to its fantastic insulating properties. 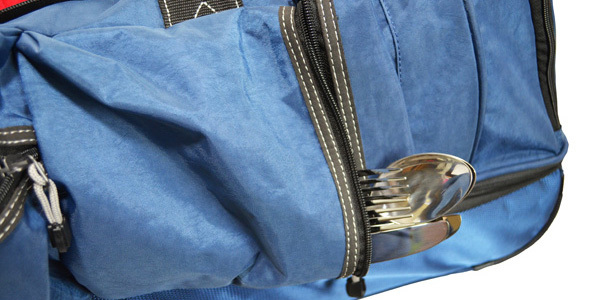 Plus it comes with a compactable spoon, so you don’t need to haul around loose cutlery. 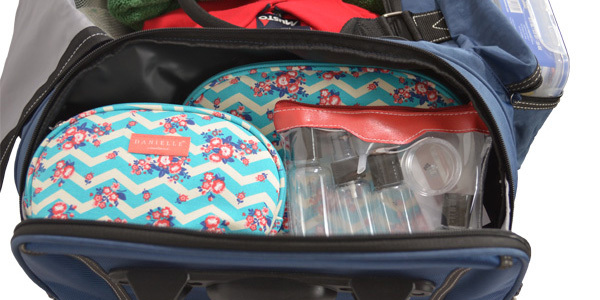 Speaking of cutlery, with the Urbanite Mega Double Decker you have multiple outer compartments that you can choose from to keep all of your bits and pieces in. I don’t know about you, but sometimes at festivals I need a break from all of the home brewed cider, and just need to indulge in a nice cup of tea or coffee. The stylish Aladdin Challenger Vacuum Flask is ideal for keeping your hot liquids at a reasonable temperature for lengthy amounts of time. Tea for two? This flask comes with two cups, which means you don’t have to wait for the other person to stop drinking before you can have your share! 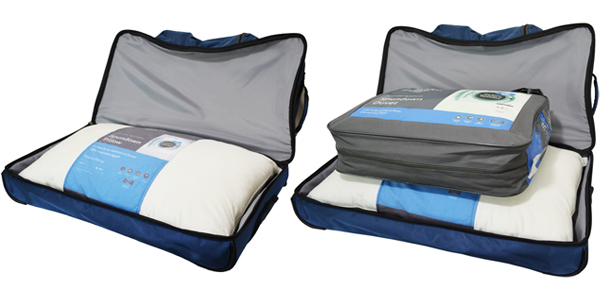 Simply pop it inside your case in the large netted compartment to minimise hand luggage. You’re at a festival, but that doesn’t mean that you can’t pamper yourself with toiletries whilst you’re there; you are going to need something to keep you feeling fresh. Keep all of your cosmetic products safe and sound in a beautifully designed floral Danielle Chevron Bouquet clutch wash bag. These wash bags have been made from a hard wearing canvas that is sure to withstand all of the bumps and grazes of travelling. So you might not want to take a whole bottle of shampoo and conditioner with you, or a whole can of hair mouse, but with the Danielle 7 Piece Air Travel Set you can neatly compact all of your essentials into the small containers that are included in the set. Plus you won’t have to worry about leakages, thanks to the waterproof plastic case that is included with the set your festival clothes are free from harm against your leaky lotions. Again, all items fit neatly into the opposite side pocket of the Urbanite Mega Double Decker. So where do all of my clothes go? All of your festival clothing items can be placed into the main body compartment, this spacious area is perfect for storing all of your clothes and towels. 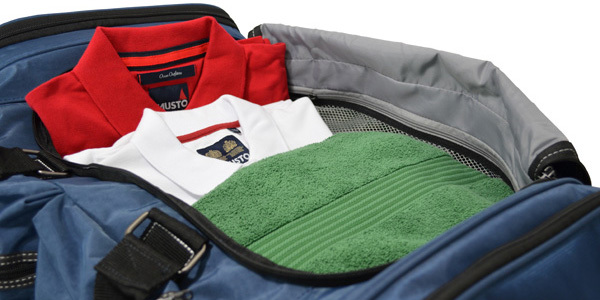 In this separated compartment your clothes won’t get soiled from the process of living out of your case for a week. Double and triple check that you have got your festival tickets. Take plenty of bottled water (stay hydrated). Take a small first aid kit, because you never know! Most importantly have a blast; you’ve been looking forward to this for a while now… Go have fun! Follow my latest blogs for important information surrounding all of the latest luggage trends, new and improved gadgets, and all you need to know about particular suitcase ranges. Aladdin, Antler, Danielle, Dubarry, Duvet, Festival, festival luggage, festival wellies, Lock and Lock, Luggage, Pillow, The Fine Bedding Company. Bookmark.